It was a sandwich kind of morning in the Layer house. 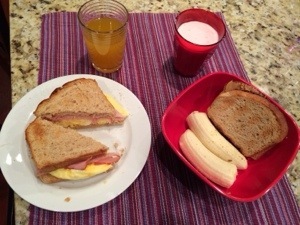 A ham, cheese and egg for me, with 3/4 cup V8 Fusion juice, while Andrew had pb&j with a banana and strawberry kefir. Kept me full from 7:30 to 11! I’d been craving a breakfast sandwich for awhile… The secret to perfectly cooked eggs that don’t make a mess? Whisk 1 egg with a splash of milk (shredded cheese optional) in a bowl and microwave for about a minute. Don’t forget to spray the bowl with non-stick spray; a perfectly round egg will slide right out and onto your sandwich! So, I went back to school yesterday… I can’t say I was ready to end my break (who would be? ), but it’s nice be getting into a new routine. Plus, the sooner I start, the sooner summer will come! 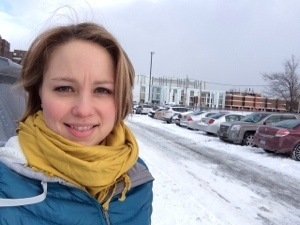 Speaking of summer…it’s quite the opposite here. It’s been absolutely frigid here, and Buffalo is even worse being close to the lake. Let’s just say walking to and from class is absolute torture. 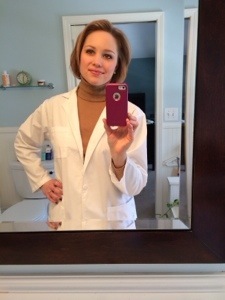 Today was my first clinical rotation = lab coat day! We basically just did HR stuff, like getting our badges and things, but we’ll start seeing patients as early as next week. Scary exciting. ‘Chicken and Noodles’ is something Andrew and I came to dread when we lived in Ohio. It was goopy, tasteless, colorless and just blah. Granted, it was usually cooked in massive amounts to feed a herd of hungry, less-than-picky Midwesterners. It’s not like I was expecting gourmet, but still. Anyway, so when I found a recipe for Chicken and Dumplings from Cooking Light’s newest book, ‘Lighten Up, America!’ I don’t have the book, but the recipe was featured in a recent issue of the magazine. In that same vein, I don’t get the magazine anymore, either. (Not enough time to read it with school!) So, all I have is my magazine cut-out. ANYWAY. I decided to give dumplings a try. Why not? Glad I did–Andrew loved it and I enjoyed making it. Basically, it’s a recipe that takes you from making your own chicken stock as the base (with extra for the freezer!) 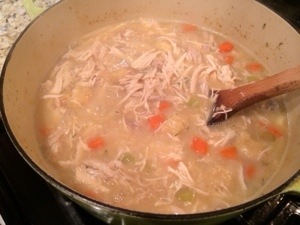 to plopping little flour-and-buttermilk dumplings into the simmering stock. I loved that for basically the cost of a 4-lb chicken and some basics (onion, celery, carrot), I got 16 cups of stock and three or four meals out of it, two of which are bagged and labeled in the freezer for a busy night once school starts. You simply boil the chicken with celery and onion, then strain it all out and shred the chicken. I also thought this was an excellent way to make chicken noodle soup by omitting the dumplings and adding egg noodles, or whatever noodle you like.